A recent report generated by industry body CII and KPMG revealed that billions of devices will be connectable with an ability to drastically improve the quality of living in India in next two-three years and change the way products are experienced. In fact, as per the study the online retail spend in the country to be reached by 2018 is pegged at $16 billion that is somewhere around Rs 1 lakh crore and that the number of people buying online is expected to touch 128 million. “Digital infrastructure is a key enabling technology for a connected and instrumented world. It is expected to create tremendous opportunities for various technology players across verticals like smart cities, smart utilities, smart healthcare, smart transportation and more in India,” KPMG India partner K Raman said. Mr. Raman also said that in order to create more opportunities and economic value, there is the need for industry players and society need to leverage digital infrastructure. The report also revealed that chances are mobile sensing health and fitness app downloads to reach almost 1.4 billion globally by 2017. 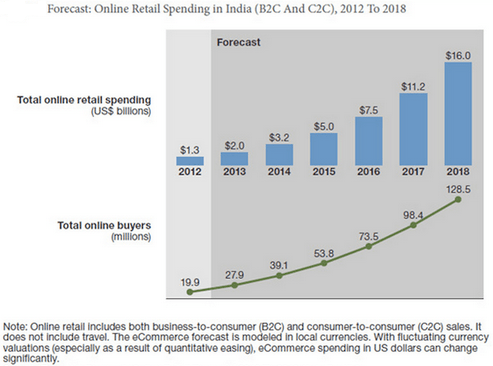 “Also, Indian online retail spending will may reach $16 billion by 2018, where online retail in India grew by 67% in 2013. The number of Indian online buyers is expected to grow to 128 million by 2018,” it added. However, the report also emphasized on the challenges that are expected to take birth with the digital infrastructure going mainstream such as security, data breach and interoperability, which may create a barrier for the overall framework. As per the study, to achieve long-term success of digital infrastructure in a country like India things like how well infrastructure operations work along with technological challenges matters a lot.